Heat oven to 400°F. Whisk together flour, oats, brown sugar, cinnamon, cayenne, baking powder, baking soda and salt. Cut in butter with a pastry blender or rub in with your fingers. (The largest pieces should be the size of small peas.) With your fingertips, flatten butter pieces into small disks. Add buttermilk, egg and chocolate chips, stirring until dough just comes together. Turn the dough out onto a floured surface; pat into a 1/2-inch thick circle. Place on a greased baking sheet and cut the circle into 8 equal-sized wedges. Bake 20-25 minutes in the preheated oven, until raised and browned. Split wedges, and serve warm. You can substitute your favorite dried fruit for the chocolate chips if desired. This scone dough can be prepped in advance, stored in the fridge and baked just before serving. 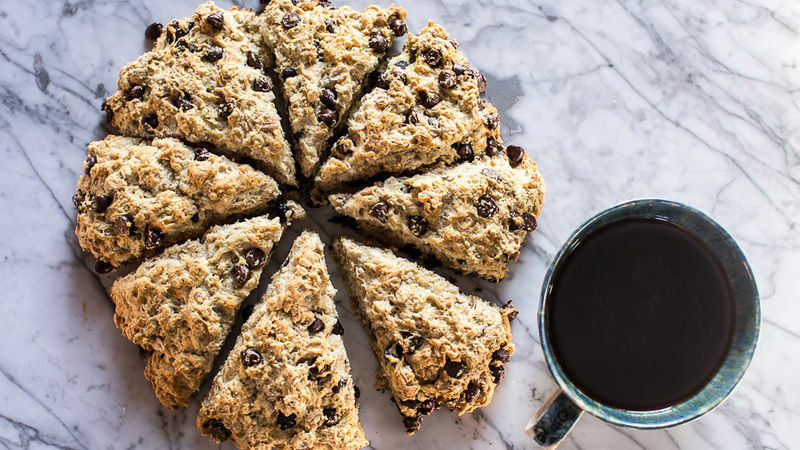 Mexican spices add a flavor boost to these chocolate chip oatmeal scones. SCONES! Can you believe that before this I had never, not once made scones? I know, so crazy. I guess I've always thought scones were kind of boring. You eat them with tea in England? K, well that’s cool, but nothing made them sound delicious… until chocolate stumbled into the name and I was ALL OVER them. And these are not just any chocolate scones. NO. See, these are Mexican Chocolate Chip-Oatmeal Scones, so they're loaded with chocolate chips and kicked up a notch with just a pinch of cayenne and cinnamon. It’s the perfect thing to pick you up on any sleepy morning. Cut in butter with a pastry blender or rub in with your fingers. (The largest pieces should be the size of small peas.) With your fingertips, flatten butter pieces into small disks. Add buttermilk, egg and chocolate chips, stirring until dough just comes together. Turn the dough out onto a floured surface; pat the dough into 1/2-inch thick circle. Place on a greased baking sheet and cut the circle into 8 wedges. Bake 20-25 minutes in the preheated oven, until raised and browned. Split wedges, and serve warm. So good!